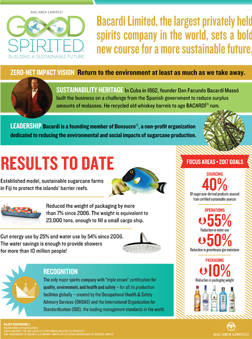 WATCH THE VIDEO WATCH THE VIDEO Bacardi Limited raises the bar on sustainability. Bacardi considers global environmental innovation part of its DNA. Our goal is to return to the environment at least as much as we take away. We’re setting a sustainability standard for others in the spirits industry to follow.